Use your own image or order a custom design! Fast Delivery, High Quality, A+ Customer Service. Ship Time: All available shipping methods are displayed at checkout. What type of design will you need? ↪ I have ONE finished image of my own. Perfect! Set up of one image is included with purchase. Just select 'Have 1 Ready File', place an order, then attach your file in an Etsy message here or e-mail directly to ali [!at] buttonhead.biz. I will be in touch within 1-2 working days to confirm and show you a sample of the print setup. You will absolutely have a chance to revise and approve the setup before production begins. ↪ I need help creating ONE original design (with graphics and/or text). Let's do it! I am happy to work with you to create exactly the image you need. Buttonhead has been making custom-designed products since 2007. I really do know how to create artwork that you will love, and that works for these products specifically. Just select 'Need 1 Custom Design', place your Etsy order, and write a note during checkout to describe your idea. I will be in touch within 1-2 working days to confirm and show you a sample. You will, of course, have a chance to revise and approve the final design. Please note: Custom artwork pricing does not include release of the final digital file, is non-refundable once work begins, and is a flat fee based on estimated labor. ↪ I have/need MORE THAN ONE photo or image. If you have basic design skills, you can download my easy-to-use templates to set up your order for print, and use as many images as you'd like for no extra charge. 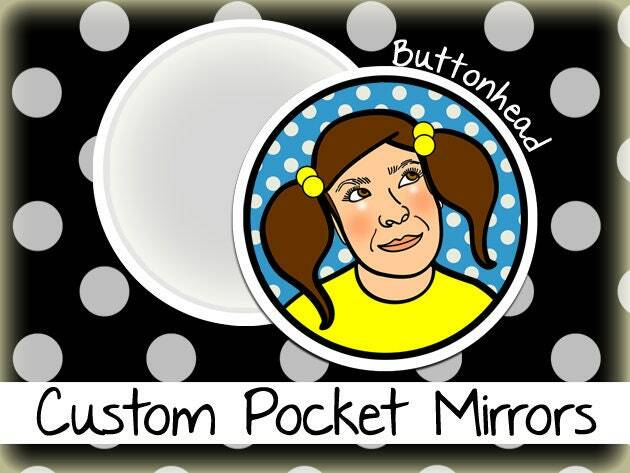 The templates are available along with button design tips and answers to FAQ at: https://www.buttonhead.biz/templates . When your artwork is 100% print-ready, select 'Have 1 Ready File' above, place an order, and e-mail your 1 zipped file to me directly at ali [!at] buttonhead.biz. No design experience? No problem. I can still create your order using more than one design! There is a per hour fee for the extra graphic design labor. Some projects take less than an hour, while some take longer. For a quote, send an Etsy message or e-mail to ali [!at] buttonhead.biz. Please include a detailed description of your project, including SIZE, QUANTITY, and DATE NEEDED. Buttonhead has been around since 2007. We're all about easy ordering, friendly interaction, high quality items, and fast production. Each item is handmade in the U.S.A. with genuine Tecre parts. Artwork is professionally color laser printed on bright white by a trained graphic designer and certified print specialist. We care about providing a high quality product, excellent customer service, and an experience for you to remember. WE ACCEPT ALL MAJOR CREDIT & DEBIT CARDS VIA PAYPAL - NO ACCOUNT REQUIRED! E-CHECKS: E-check orders will be processed when the payment has been approved. RECEIPTS: A receipt will be e-mailed to you immediately upon purchase. If you would like to have a paper copy included with your shipment, please use the order notes to request one. ILLINOIS SALES TAX: At the time of payment, a 7.25% sales tax will be applied to the full order amount for orders delivered within the state of Illinois. We want you to be 100% happy with your purchase. If you have any issues with your order, please contact within 7 days of receipt. - Product issues due to mechanical print error. - Product issues due to mechanical assembly error. - Custom design fees (even in the event of a cancellation or a physical product refund). - Products which contain a client-approved or client-provided typographical error. - Products which do not meet graphic alignment, color, or sizing expectations (these aspects are addressed and approved during the ordering and proofing process). - Any and all shipping costs (initial and/or for a return package). - Products and shipping cost for packages delayed/lost in transit by the shipping carrier. - Products and shipping cost for packages delivered or undeliverable to client-provided incorrect shipping address. CARRIER & CLASS: The shipping method for each item/quantity is included in the individual product descriptions. Upgraded shipping options may be available during online checkout or contact for a quote. U.S. TRACKING: Delivery confirmation info will be e-mailed to you upon shipment. PACKAGE INSURANCE: Mailing insurance is available on request, but is not included with standard shipping. If you would like to have a package insured, please contact for a quote. LOCAL PICKUPS: At this time, Buttonhead does not have a local pickup option. We apologize for any inconvenience and are planning to offer this service in the future. Currently, all orders are shipped. INTERNATIONAL SHIPMENT AND CUSTOMS: Unless otherwise noted, international shipments do not include detailed tracking information. All orders do include the filing of U.S. Customs PS Form 2976, and the confirmation info will be e-mailed upon shipment. The customer is responsible for knowledge of the import regulations and taxes of their country. All taxes, customs and duty fees are the sole responsibility of the customer. Please be advised that package delivery time can be significantly delayed due to customs regulations. In some instances, it can take up to 30 days for delivery. Customer is responsible for communicating with the local customs office regarding package status and tax. Buttonhead will not mark packages as a gift or misrepresent the value of it's contents. CLIENT-SUBMITTED FILES: Buttonhead assumes that you have the right to reproduce any images submitted. All rights to your artwork are retained by you. We do not reproduce or reuse your images in any way, shape, or form. All artwork remains on-file for 1 year from the date of purchase for easy re-ordering. CUSTOM-DESIGNED GRAPHICS: Buttonhead reserves all rights to digital artwork created by the company. This includes but is not limited to text customization made to the tattoo art collection, ‘Design Your Own’ art, and original custom-designed graphics. Unless otherwise commissioned or negotiated, we do not release or sell our proprietary digital files. Release of digital files for custom artwork is also not included in the sale price. CUSTOM DESIGN REVISIONS: Design revisions are limited to 2 rounds of reasonable changes. If revisions exceed 2 rounds, additional fees may apply. PACKAGING: Unless otherwise noted, items arrive as a loose lot in 1 packaging unit. SPOILAGE: Bulk orders in excess of 50 pieces are typically over-filled by 1% to account for any production spoilage that may not have been removed during the quality control process. TURNAROUND TIME: When will my order be shipped? Non-Custom orders include ready-made tattoo, pin, magnet and name tag sets. Custom Orders include any items with personalized text, photo, or graphics. SHIP TIME: How long will it take for my package to arrive? * For Express shipping only: If the carrier does not deliver in time, the postage would be refundable, but please be aware, the custom order would not. Office hours until 2pm CT.
We are out of the studio Saturday, Sunday, and holidays as posted. CUSTOM ORDERS: I have ONE finished image of my own. CUSTOM ORDERS: I need help creating ONE original design (with graphics and/or text). Let's do it! Buttonhead has been making custom-designed products since 2007. I really do know how to create artwork that you will love, and that works for these products specifically. Just select 'Need 1 Custom Design', place your Etsy order, and write a note during checkout to describe your idea. I will be in touch within 1-2 working days to confirm and show you a sample. You will, of course, have a chance to revise and approve the final design. Please note: Custom artwork is single-use and non-refundable. TATTOO ART: Unfortunately, I'm not able to accept requests for tattoo art, but try searching 'custom tattoo design' on Etsy, and you'll see some cool results. When your artwork is finished, I would love to make your temporary tattoos! CUSTOM ORDERS: I have/need MORE THAN ONE photo or image. If you have basic design skills, you can download my templates to set up your order for print, and use as many images as you'd like for no extra charge. The templates are available along with button design tips and answers to FAQ at: https://www.buttonhead.biz/templates . When your artwork is 100% print-ready, select 'Have 1 Ready File', place an order, and e-mail your 1 zipped file to me directly at ali [!at] buttonhead.biz. No design experience? I can still create your order using more than one design! There is a per hour fee. For a quote, send an Etsy message or e-mail to ali [!at] buttonhead.biz. Please include a detailed description of your project, including SIZE, QUANTITY, and DATE NEEDED. WHOLESALE PRICING: I need an amount not listed in your shop. Bulk rates are available beginning at 25 pieces, and the wholesale prices are reflected in this Etsy shop. If you need a different amount, the full rate table can be viewed instantly at https://www.buttonhead.biz . When you know how what size/how many you might like to have, just send a message to request a custom listing.